Alliances At War is an exciting online strategy game, developed and maintained by its players. It is text based and situated in a fantasy world called “Orkfia”, a world inspired by Tolkien's Middle Earth. 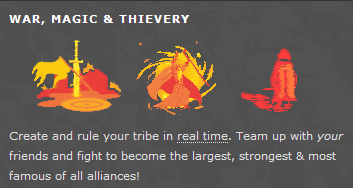 Together with other players in your alliance you will be warring others as they step in your way. The combination of strategy and war is the ultimate challenge in Alliances At War, besides basic stuff like training military, constructing buildings and trying to stay alive.